Hotel Charlotte is located in Groveland, CA, convenient to all of the best activities and vacation attractions surrounding nearby Yosemite National Park. There is never a shortage of fun to be had during your visit to the area and there really is something for everyone to enjoy. From staring in awe at the gorgeous falls in Yosemite National Park to a thrilling ride down the whitewater rapids, there’s no shortage of things to do when you choose vacation lodging at Hotel Charlotte near Yosemite National Park. See some of the most popular activities in and around Groveland to better plan your stay. 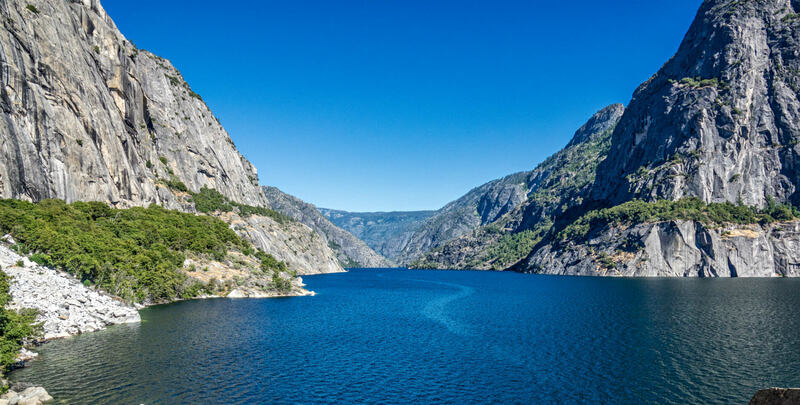 Many are drawn to Groveland to visit Yosemite National Park and see the famous waterfalls and sequoias, hike the trails, and catch sight of our wildlife – an easy thing to do with our 400 species of fish, birds, mammals, and reptiles. Open year-round, the park spans 1,200 sq. miles with 750 miles of trails and has been a protected landscape since 1864. Yosemite Hospitality, the Yosemite Conservancy, and the Ansel Adams Gallery offer guided tours and walks through the park if you want to learn more about the park during your visit. The best way to see the park is by hiking it! During the spring, come see our vibrant wildflowers set against larger-than-life Sequoias, or visit in the winter when some of the trails are open for snowshoeing or cross-country skiing. Like most National Parks, Yosemite fills up fast – especially in the summer – and it’s recommended to arrive early in the morning or wait until the afternoon when the crowds die down. A current seven-day pass for Yosemite National Park for non-commercial vehicles is $35. There are several options for annual passes, like the Yosemite Pass for $70, the America the Beautiful for $80 (covers all National Parks and Federal Recreational Lands), or a lifetime Senior Pass for $80 for visitors that are aged 62 and older. Active military members can receive a free annual pass with the proper identification. Yosemite isn’t exactly known for its fall foliage, but if you want to explore the park with fewer crowds then the fall and winter seasons are a great time to visit. There’s still plenty of hiking, biking, picnicking, and wildlife viewing opportunities in the fall and in the winter you can take advantage of the snow with snowshoeing, skiing, and ice skating! See a different side of Yosemite in the quiet season. Whitewater rafting enthusiasts have the opportunity to brave the rapids on the Class IV Tuolumne River near Yosemite National Park. The scenic Tuolumne also provides some of the best fishing in the Groveland area. Another great spot for both fly and bait fishing is nearby Pine Mountain Lake, a private community where some of our guests discover their next home or vacation property. There you also can explore the area on a guided horseback ride or enjoy a round of golf. Groveland, CA is home to some eclectic restaurants and cafes. While staying with us at Hotel Charlotte, choose from a variety of restaurants with unique menus, many of which use local ingredients. Whether you’re looking for fine dining or a casual meal, there’s an option for every occasion in Groveland. We offer a full bar, local wine and a variety of craft beers on tap. Try a canned cocktail or wine to take with you, or choose from our extensive selection of wines by the bottle. The eclectic saloon boasts of being the oldest continuously operating saloon in California and the aged woodwork and huge iron doors are testament to this. Steaks and burgers are their specialties! The Iron Door Saloon is absolutely worth a stop, hungry or not! Wonderful coffee, inviting atmosphere, a beautiful nursery out back, and stunning photography by local artist Robb Hirsch. Priest Station is a family-run restaurant serving classic American food, offering grass-fed beef burgers and 6-oz. certified Angus burgers. Dine in a relaxed setting with panoramic views on their outdoor patio. Pizza, pasta, sandwiches, salads, calzones for dine-in, take-out and delivery. They have a large arcade for your kids as well as a bounce house for special events. Family-owned pizzeria offering indoor and outdoor seating. Salad bar, baked subs, calzones and of course, pizza! The 16,000-sq-ft restaurant and lounge overlooks the Pine Mountain Lake Golf Course. The outside deck is perfect for outdoor dining or just cocktails. Guests can enjoy live music while dining on most Saturday nights. Firefall serves a variety of their own in-house roasted coffee making this is a great place to stop by for the perfect warm cup of joe to start off your day of adventures! This is the perfect local spot to satisfy every meat lover’s palate. They offer a variety of options from grass-fed beef, choice beef, organic poultry, deli meats, breakfast meats, quality pork, to deli sandwiches, cheeses and salads.